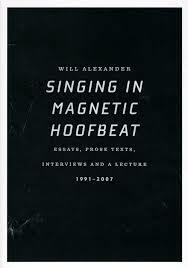 Will Alexander is a visionary and ecstatic writer whose most recent book is Singing in Magnetic Hoofbeat: Essays, Prose Texts, Interviews and a Lecture, published by Essay Press. Other recent books include Kaleidoscopic Omniscience, Mirach Speaks to His Grammatical Transparents, Inside the Earthquake Palace and Compression & Purity. Alexander’s prolific body of work radiates radiance and exemplifies a type of luminosity that seems extremely rare in this world. His verbal flights soar far above the quotidian to a place of vision. Alexander’s use of language is alchemical and talismanic, relating to mental travel through the expansion of awareness and the unfolding of alternate modes of perception. 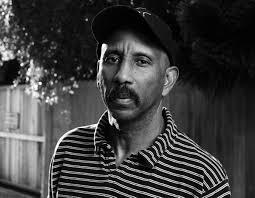 I’d like to thank Will Alexander for providing a way to see, a way to facilitate the envelopment of energy, and for engaging me in this discussion. Chris Moran: Your writing often takes me to remote sectors of the psyche where the language of poetry is not the exception but the primary ruling principle. This has something to do with your expansive vocabulary, which often incorporates the language of astronomy, geology, mathematics, alchemy, botany, mythology, geography, and many other fields. Your use of language goes far beyond the ‘neuro-linguistic programming’ that can stifle the imagination. It feels akin to scrying, and I sense there is something deeply alchemical going on. How is this lens of perception attained, where poetry is indistinguishable from philosophy? Also, do you see language as divinatory? Will Alexander: When language is felt as a living intelligence it quickens as one internally develops. One can feel its spontaneity like a drone in one’s system. For me, it magnetizes itself to different genres, and to various branches of knowledge. All knowledge springs from the 26 letters of the alphabet, being a poet I am naturally magnetized to its spectrum. Being free, I can range across its field of expression, which includes medicine, astronomy, botany, history, music, cinema, mysticism, architecture. It’s an infinite and evolving list. I’m picking up murmurs all the time. In this sense as I write language takes on an alchemic personality, like an Amazonian flooding replete with the ferocity and power of aboriginal presence. A power yes, but not unlike the mathematics which the old Kemetians used in constructing the pyramids. A living word is not unlike a living number creating a pulsing construct, be it a piece of writing or a pyramid. In this sense creative language is not adverse to philosophical utterance of the vatic. CM: It’s not unusual to come across words in your poems that I’m unfamiliar with, and many of your books feature a glossary. What you do reminds me of Hart Crane’s dictum to “create new words, never before spoken and impossible to actually enunciate.” This goes far beyond the saturation of elemental forces, as it incorporates planetary and cosmic energy. Where does this knowledge come from? Is it necessary to access alternate modes of perception in order for poetry to process knowledge, or for a poet to embody knowledge? How do you attain this multidimensional framework? WA: I’ve been engaged in a praxis sustained across duration. I’ll call it in this context poetic yoga. I remain in poetic trance day and night. It is a living world. As I stated earlier the poetic is always murmuring to such an extent that I feel its palpable presence within me. It is a presence which was first introduced to me when I learned about circular breathing. When one can breathe through one’s medium to such a degree that quotidian distraction can gain no entry. One then embodies whatever one is writing on to such a degree that the specific nature of the subject at hand ignites from the root being engaged by the imagination takes on the tenor of the unexpected. The unexpected charged with magnetism which naturally attracts energies from what the Occidental mind calls the invisible. And it is by means of this invisibility that one can intermingle knowledges and poetically contact new lingual dimensions which ignite new synapse firings in the cortex, which can’t be predicted in an a-priori manner since organic creation carries spontaneous warmth as its resonance and by its very nature cannot be chronicled as one would abstractly add or transpose a superimposed structure replete with in-built boundary. CM: In Hindu philosophy there is a mental state known as turiya, which incorporates waking consciousness with dreaming and dreamless sleep. I sense an expansion of awareness in your writing that seeks to integrate the unknown, and many surrealists attempted to fuse dream logic in their art. Have you ever incorporated material from dreams in your writing? WA: Turiya is a state I live in as waking consciousness. For some time I’ve focused not so much on the contents of the dream, but to absorb the climate of the dream, its background vapour if you will, letting that vapour seep back into the conscious mind. It’s gotten to a level where for the most part waking consciousness and dreaming consciousness have become almost indistinguishable. Which means my language is imbued with the oneiric. The articles, the phonemes, the phrasing all soaked in the oneiric. It is naturally a transpersonal and telepathic language. Which allows it entry into different circumstances and levels. It is like trying to forbid the entry of smoke into structures by the locking of doors. I do not work by means of theory or preset idea. I work by spontaneous method. I am not a scholar. I see a photograph, a painting, or a poem, and if it is kindred to my inner climate it immediately sets my imagination whirling, analogous at some level to the sidereal turbulence we see active on Jupiter and Saturn. CM: Many of your poems are imaginative monologues spoken from the perspective of a surreal persona, such as “The Ice Lion,” “The Blood Penguin,” “Water on New Mars” and others. Where do these surreal entities come from? WA: I am an instinctive animist. When animism combines with the imagination the inexplicable ignites, the fantastic appears and speaks. It seems each apparition enunciates its own internalize, without active intervention on my part. The murmur vibrates and unfolds with insistence; each voice is implacable and creates its own duration. I remember writing my poems “The Blood Penguin” and “The Pope At Avignon,” both voices were so strong that they took me over. It took enormous concentration to get these voices down on paper so it wouldn’t blur and then scatter in my mind. What each voice said and was about to say seemed to happen all at once, going much faster than my mind seemed capable of capturing. Maybe such experience implies a level of the mind that is not commonly exercised in the Occident, being rife as it is with denial and evasion. Of course this is something Breton made note of many years ago, imaginal paucity which marks a good part of modern writing. CM: Julian Jaynes has described poetry in the ancient world as divine knowledge and “the language of gods.” He also writes about poetry as auditory hallucination. What’s the difference between poetry and glossolalia? Is poetry a shamanistic practice? WA: Poetry and glossolalia are for me simultaneous. Imaginary language written or uttered in trance. Poetry is a shamanistic practice, it is the oneness of utterance. WA: I’ve understood that by remaining open to the powers of the imagination language can give insight into the mysterious. From figments of information combined with explorative language, insight arrives and clears the mind of doubt and abstraction. For instance, the seed of life on Earth is a hologram of the knowable cosmos. Hybrid beings on Mars for instance, all tending toward the human form. Look into the face of a zebra or a lion and you see the basic structure of the human face. In fact, the formation of the eye is pre-human and goes back at least 500 million years ago. Add to this the quarter of a billion galaxies that exist between Andromeda and the Milky Way so why do we limit experience to the cosmos of present human assumption. It is no better than the era of Dante where the worldview was dominated by the Ptolemaic Sun system. Here we are post-Hubble, with chrononauts amongst us still lingering in an outmoded linearity, appeased by what’s considered hi-tech advancement. My complaint with many brilliant minds is that their ideas are encased inside a backward looking linguistic expression. Asimov still relied on a 19th century architectural language no more advanced than Tolstoy. I’m interested in language which stirs inside the nerve lengths, which engenders instantaneous firing at the level of the synapse. This is why I am grateful for beings like Sarduy and Beckett, who overthrew the old storytelling methods. I feel akin to those old Dogon astronomers who knew of Sirius B long before it was known by Western technology. What most uplifts me are the powers inherent in interior technology, which I intuit has corresponding resonance with other levels of intelligence which saturates the cosmos. Language being our prime vibratory antennae. CM: In your bibliography in Compression & Purity there is a book listed that doesn’t yet exist, Aboriginal Salt: Early Divinations, and there was recently a failed campaign to fund the publication of the novella Alien Weaving. Are either of these books forthcoming? WA: The Early Divinations is coming out from White Print Inc in Detroit late this year or early next. As for Alien Weaving it continues to hover. Each book is like a child, each one has a different odyssey. I’m sure that at some point Alien Weaving will emerge. In the meantime there are a couple other books due out, one co-written with Carlos Lara, and the other with Janice Lee. Also, there are quite a number of books I’ve written which have not been typed or attended to since the initial writing. Chris Moran lives in Columbus, Ohio. His chapbook GHOSTLORD is forthcoming from Solar Luxuriance.